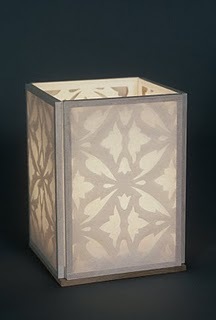 In this workshop, participants will create a shadow lantern, composed of lightweight wooden panels featuring cut-outs that cast shadows onto a second layer of paper. The unique flexible Japanese hinge flexes in both directions, creating a versatile structure that can be assembled as a book, lantern or screen. Fee: $50 + $10 materials. Click here for registration information. If you’ve forgotten, never knew, or just want to delve more deeply into the language of color, come and find out how to get those colors you seek down on paper with ease and pleasure. We’ll work both systematically and intuitively, creating a beautiful color wheel and other studies. Our experiments will focus on the autumn palette, inspired by fall subjects such as leaves, acorns and fungi. Our practice will deepen your awareness of how colors interact, what colors you are drawn to, and how to make use of this powerful knowledge in future projects . $95 including materials. For more info, a supply list and registration please contact Andie directly at (530) 647-6947 or andiethrams@earthlink.net. Both of these workshops are being organized by the artists themselves, not by 23 Sandy, so please contact the artist directly for more information, questions or registration. Heidi Kirkpatrick, a regular 23 Sandy Gallery artist and crowd favorite, has been selected for an Honorable Mention Award in the Photography Book Now competition. This major international annual competition is sponsored by Blurb and this year included such esteemed jurors as Darius Himes of Radius Books. Heidi won in the Portfolio Category for her beautiful book, Lost and Found. In other news, Heidi’s series of photographs titled Stories was recently accepted into Blue Sky Gallery’s Pacific Northwest Photography Viewing Drawers here in Portland. Stop by sometime soon to see the gorgeous works by Heidi in gallery inventory. Last Day for Pop-Up Now! Hard to Believe, isn’t it? 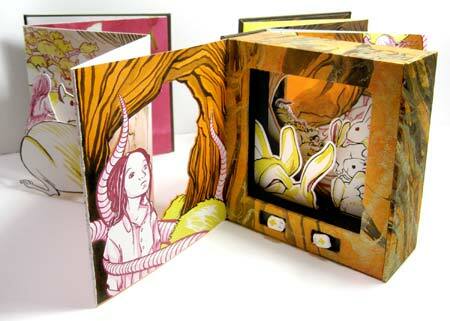 The six weeks of our amazingly popular pop-up artist books show have been just incredible. At some point today we will (hopefully!) reach 600 visitors for this show—a gallery record! Thank you to all of the artists who made Pop-Up Now such a huge success with their feats of paper engineering. Thank you to the Movable Book Society for kicking of the show with their super fun weekend conference here in Portland. Thank you to video journalist Bob Bullock at KATU, for his gorgeous segment that aired on AM Northwest. Thank you to Kartrina Sarson and her merry camera and sound crew who created a first-ever “Art Beat Extra” segment that aired on Oregon Art Beat just because they loved the show so much. The number of people who came to the gallery after seeing the show was astounding. Thank you to Deborah and Steve for sitting the gallery while I went off and peddled books in San Francisco. Silly to schedule a trip during the busiest show in gallery history, for sure, but who knew? You all contributed to an amazing show that couldn’t have happened without you and I appreciate you all. Just wanted to write with an update on our amazing Pop-Up Now show. First, I must report that this show has been so busy its hard to believe! We’ve been swamped with book lovers, art lovers and everyone in between. Thanks to everyone involved in this fantastic show. Pop-Up Now was recently featured on AM Northwest, our local ABC TV affiliate’s morning show. Catch the clip here. Congrats to all the Pop-Up Now artists who caught the eye of Katrina and the crew of Oregon Art Beat TV show. The books all look just amazing in the video that aired Thursday night. Check it out at the link. EXTENDED Submission deadline for postmarked entries is October 15, 2010. 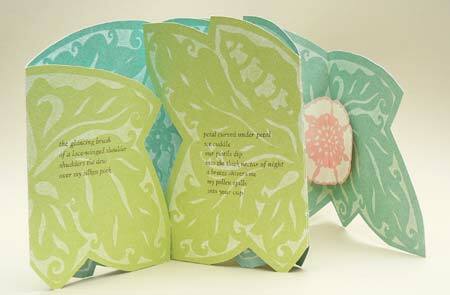 The Arts Center will host a national juried exhibit of book arts, to include all book art practices. We seek “books” of all shapes, forms, and media – altered books, bindings, unique pieces, samples of small editions, books with imagery, books with calligraphy and so forth. 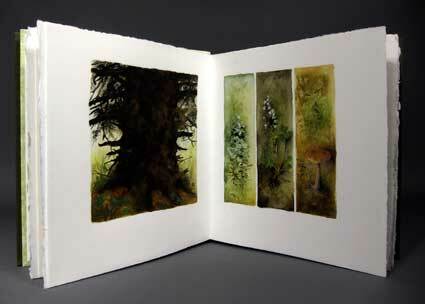 With the exhibit we will introduce the medium of artist books in its broadest sense to the Corvallis community; it will show the range of what an “artist-book” could be. The title and theme of the exhibit “Un-speak-able” refers to the fact that a word can have many interpretations, and at times a picture is worth a thousand words. A few definitions for the term are…”communication beyond the spoken word, miscommunication, inadequacy of the spoken word, incapable of being described in words, unbelievable, restricted speech, nonsense, lost languages, appalling.” How would you define “unspeakable”? Juror: Barbara Tetenbaum, Professor and Book Arts Department Head at the Oregon College of Art and Craft, is the founder of Triangular Press, her artist book imprint. Her books are exhibited and collected in the United States and abroad. In turn she is an avid collector herself. She is the recipient of the 2010 Sally Bishop Faculty Fellowship at the Center for the Book in New York City as well as a 2010 RACC Project Grant. 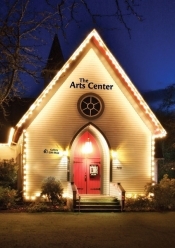 Other awards include an Oregon Arts Fellowship, other RACC grants and two Fulbright Fellowships. 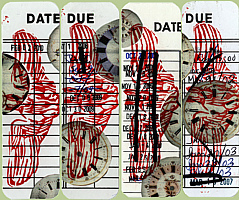 Tetenbaum earned her MFA from the School of Art Institute of Chicago. Awards: The juror will select cash awards from the actual work, while having selected participants from digital images. Fee: There is $15 submission fee. Invited artists are asked to pay all shipping expenses. The fee will be used for juror’s fee and cash awards for artists. The Bookmarks projects series is curated by 23 Sandy Gallery artist Sarah Bodman who is a book arts research fellow at the University of the West of England. 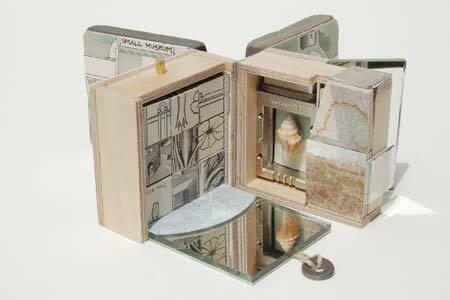 With this unique project Sarah’s aim is to encourage appreciation of work in the format of the artist’s book. Participating artists each hand-produce an edition of 100 signed and numbered bookmarks to give away through distribution boxes at venues around the world. Each bookmark has the website address which brings visitors to the gallery of artworks online. Over the last six years the Bookmarks series of free artwork distribution has visited 60 venues in Italy, The Netherlands, the UK, Ireland, France, Denmark, Germany, Poland, Singapore, Turkey, New Zealand, Canada, Brazil, South Korea, Cyprus, Croatia, New Zealand, Japan, Australia and the USA. Over 280 artists have contributed more than 28,000 bookmarks to the eight projects to date. Editioned bookmarks are collated into sets; one full set being sent to each of the contributing artists and the rest divided and sent in distribution boxes to participating galleries, bookstores and libraries around the world, for visitors to take for free. Bookmarks VIII Escaping the Library System 2010-2011 – has a twist – this time, it was library staff making them rather than distributing them. Quite a few previous bookmarks makers have been librarians, so Sarah thought she would ask library workers to infiltrate some non-library venues with their own bookmarks. 23 Sandy is thrilled to be a distribution venue for the librarian bookmarks. Each month, through February we will put out a new batch of bookmarks. So, stop by and take your pick from this inspiring, community-building project. Please join us for an artists reception for Pop-Up Now tonight from 5-8 p.m. It’s a terrific chance to see the show, enjoy the gallery hopping crowd and get a chance to meet a few of the artists. See you soon!